If you live in North America, there’s a pretty good chance you don’t exactly enjoy the taste of licorice. In fact, it’s likely that you hate it. And in that case, the simple thought of licorice ice cream, licorice breadsand pastries, and licorice marinated meats—all washed down with an ice cold licorice beer or cocktail—probably makes you cringe. Unquestionably one of the culinary world’s most divisive flavours, licorice has the power to induce both sour-faced revulsion from those who detest it, as well as glowing praise from its minority of devotees. This is especially true in the United States, where the black stuff has long been a perennial Halloween night reject. But is the revulsion justified? How well do we really know the enigmatic stuff sometimes referred to as the “sixth flavor”? Enter LAKRIDS, founded by an enterprising young Dane, Johan Bülow, in 2007. Bülow started the company in his mother’s tiny kitchen on the holiday island of Bornholm, southeast of Copenhagen to rediscover traditional licorice recipes and combine them with the best raw materials in order to create something that is both familiar and loved. 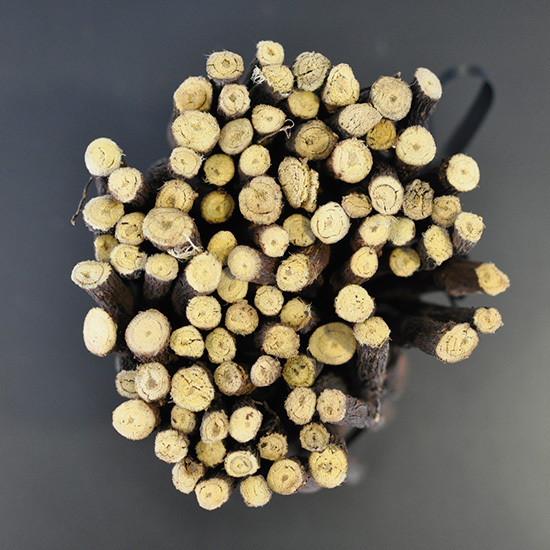 Part of the problem, LAKRIDS’ Peter Husted tells us, is not that people simply love or hate the stuff, but rather that they dislike things called licorice—things which actually have little to do with real licorice root. He challenges the love/hate dichotomy as a false divide, and blames a globalized food industry for the wholesale “destruction” of the popular palate—which has in turn created mass aversion to complex, nuanced flavors like licorice. Although some varieties of licorice root are naturally thirty times sweeter than sugar and possess a range of flavors, many of us have only ever known the stuff to be a tough, tar-like and artificially flavored black candy that closely resembles deer droppings. With licorice, Peter explains, “we’re giving chefs another tool for their toolbox—and what they’re doing with that tool is truly remarkable.” And so, as licorice finds new ways into the culinary zeitgeist, perhaps there’s even hope that those of us who grew up hating the strange black stuff might someday even become licorice lovers. Perhaps. Catch a bite or two of LAKRIDS if you should find yourself in Copenhagen, as their confections are just about as ubiquitous in that fair city as any “caviar of candy” has the right to be. Their products have also made their way into shops from New York to Dubai and can be shipped almost anywhere. For a little extra inspiration, take a look at their collection of delightfully improbable licorice-laced recipes of all sorts. - Words by Austin Sailsbury in Denmark.